Collaborative "Carmina Burana" is Breathtaking! After experiencing Skylight Music Theatre’s multi-media, multi-disciplinary performance of the symphony/concert/opera/dance piece with the unforgettable hook, it’s easy to see how an artist would regard this as a bold new chapter in his work. 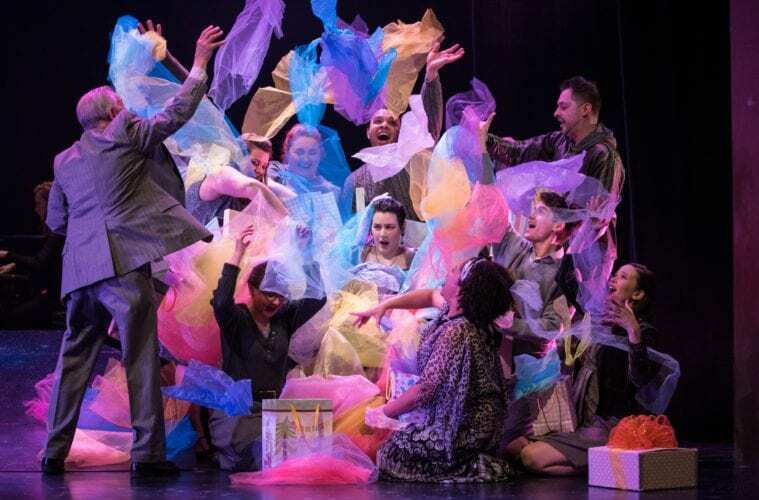 Often performed as an orchestral piece with a standard chorus, this version, running in the Cabot Theatre at the Broadway Theatre Center through March 31, is probably much closer to what Orff had in mind. His concept, which he called “Theatrum Mundi,” was an attempt to inject the grandeur of Greek tragedy into music performances. Though the Skylight could not enlist the full orchestra and cast of hundreds that Orff might have dreamed of, the company does feature 12 vocalists from The Skylight and Milwaukee Opera Theatre; 7 dancers from Danceworks Performance Company; 4 singers from Chant Claire Artists; 5 young performers and 6 percussionists onstage — including two grand pianos — while hosting the Chant Claire Chamber Choir in the upper-most balcony of the theater. This cast, combined with inventive costumes (Shima Orens), striking lighting design (Jason Fassl), and projections that enhance the colors and mood of each piece, make the 65-minute performance a kinetic and mesmerizing sensory experience. Sung in Latin, “Carmina Burana” presents a fascinating “wheel of fortune” that touches on universal human experiences. Without understanding a word, it was easy to follow the celebrations of the changing seasons; the feelings of love and jealousy, drunkenness and longing; and the rites of birth and death depicted over the course of the evening. As performed, each movement felt timely and relevant, though the texts were penned in the 13th century. Other elements that added to the universality of the stories were the diverse cast and unorthodox costume design. Deliberately inclusive, the cast included performers of all ages, shapes and sizes, while their clothing spanned the class spectrum from the evening gown of an elegant socialite to a medical worker in scrubs, to a homeless person with fraying hems in his coat and pants. In many iterations of gray, the ensemble absorbed and radiated the brilliant colors of the lighting design, morphing from one vibrant shade to the next depending on the moment in the group’s circular life journey. The forceful and ever-impressive “Fortuna Imperatrix Mundi” (Fortune, Empress of the World) begins and closes the performance. Called one of the most over-used pieces of music in popular culture, this arresting refrain has been part of the soundtrack for dozens of movies and TV shows. It plays underneath the action of The Battle Cats video game, and has been used in commercials to sell everything from Old Spice aftershave, Applebee’s restaurants and Adidas shoes to Domino’s pizza. Rest assured that it is even more powerful in person and in context, and actually benefits from our familiarity with it. Other pieces depend on theatrical elements to make their themes clear. Fortunately director Jill Anna Ponasik uses her distinct gift for translating often daunting and historic opera pieces into accessible performances with a modern feel. “The joyous face of Spring” found performers seated on stage in family groups enjoying picnics. The young performers played games while dancers frolicked with lime green silk scarves that floated like kites in a warm breeze. A film of daisies filled the round screen that dominated center stage. In another upbeat piece, a very pregnant woman in a pewter evening gown and long black gloves (Jackie Willis) is the guest of honor at a contemporary baby shower. After the well-wishers present gift bags full of toys, blankets and clothes, more colorful silks masquerading as tissue paper are launched into the air, raining down bright squares of electric blue, hot pink, lilac and tangerine. In “Shopkeeper, sell me blush,” three women of vastly different ages and stages of life look wistfully in the mirror of a dresser, and fantasize about the men they will entice with a bit of make-up. Meanwhile “In the Tavern” there are unmistakable arguments between lovers (Tim Rebers and Laura Basse) and a drunken man bemoans his glorious youth, illustrated through tragicomic dance by Zach Schorsch, sporting a striking sequined jumpsuit. As the stories got darker, projections shifted following the seasons. Rain turned to icicles. Then a starry sky gave way to a brilliant sunrise. On a stage jam-packed with singers and musicians, the dancers of Danceworks had an even more challenging task — bounding, spinning, collapsing and posing in very small footprints — often near the edge of the playing space. They not only seemed to navigate the close quarters effortlessly, but their leaps, slow backbends and grasping hands lent urgency and action to already stirring music. They also brought additional color to the stage, as the only performers who wore costumes in shades other than gray. 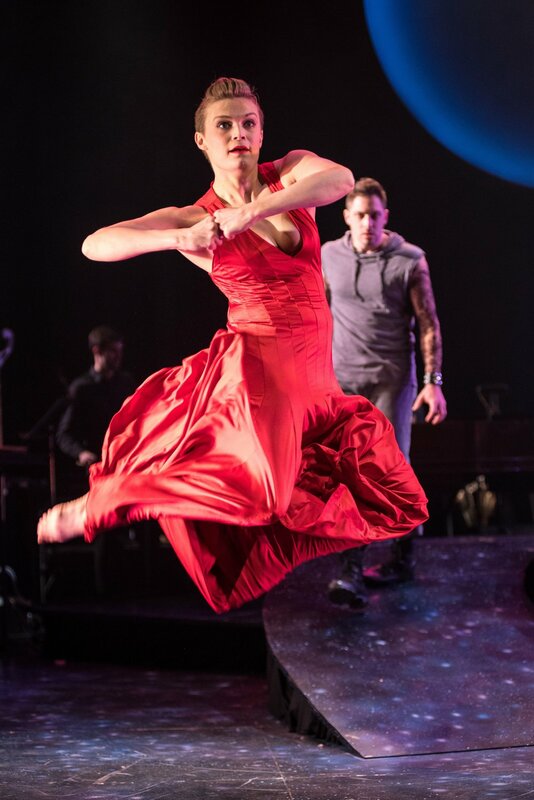 In particular, Christal Wagner enchanted the audience in a full-length, lipstick red dress that swirled around her like a matador’s cape when she spun. Just as her combination of grace, whimsy and athleticism drew focus during Milwaukee Opera Theater’s “Magic Flute” earlier this year, it is hard to take one’s eyes off her every time she steps onstage. As a silent participant she added volumes to the storytelling. And then as quickly as it began, the chorus is repeating “Fortuna Imperatrix Mundi,” signaling the end. And like the wheel of fortune, another beginning. A thrilling evening for fans of any and all of the performing arts, you will never see a commercial for the Olympics the same way, after you have seen “Carmina Burana,” the way it is supposed to be performed.